Brookhaven, GA, March 13, 2019—Peter Rabbit is heading to Brookhaven a week ahead of the regular Easter Egg Scramble to accommodate extra sensory or special needs youngsters. On Saturday, April 13, from 10 a.m. to 12 p.m., the Eggstraordinary Easter Egg Hunt will be held at Lynwood Park, 3360 Osborne Road. 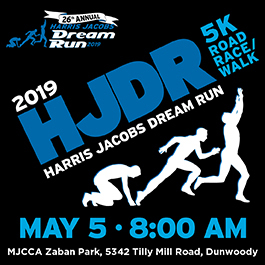 This new event will provide special considerations for visually and hearing-impaired youngsters as well as those in wheelchairs and children who are sensory-sensitive. The holiday funfest will be held on the outdoor basketball courts (handicap accessible) behind the recreation center. Activities will include beeping eggs, magnetic eggs with wands to help find them, a bean bag hunt for sensory-sensitive children and other activities specially tailored to the youngsters. All those wishing to participate should bring their own basket to use when gathering the Easter eggs. The Easter Bunny will be there to pose for pictures and volunteers will offer face painting, all free of charge. Participants are encouraged to bring along their siblings, who are welcome to participate in the event. 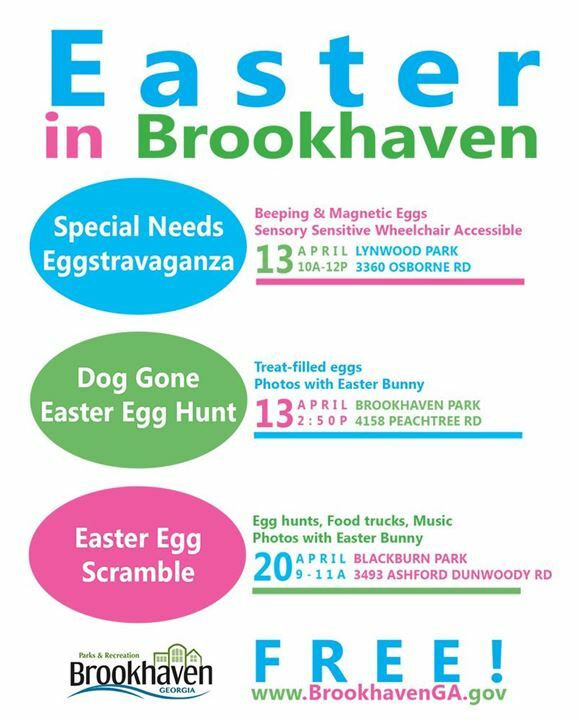 To keep the Easter festivities going, another special event is planned the same day (April 13) at the Brookhaven Park Dog Park, 4158 Peachtree Road. The Dog Gone Easter Egg Hunt is being offered for all residents and their fur babies at 3 p.m. Specially prepared Easter eggs, containing pet treats, will be hidden throughout the dog run with participants asked to meet at the top of the hill there at 2:50 p.m. for the start of the hunt. Pet owners are encouraged to keep their dog on a leash throughout the hunt to maintain pet control and help prevent accidental ingestion of the treat-filled plastic eggs. Peter Rabbit will also be on hand to post for a photo with dogs and pet owners. A week after these two new events, the annual Easter Egg Scramble, open to all Brookhaven youngsters, will be held on Saturday, April 20 in Blackburn Park, 3493 Ashford Dunwoody Road, from 9:30-11 a.m.